The Palace is basically a collection of attractive buildings inside four walls along the banks of the river. Everywhere you look, the architecture is beautiful with pavilions, gardens, and halls laid out around attractive lawned areas and walkways. The Palace is still a place of work for some royal officials and is protected by military guards, but it’s also the most popular tourist attraction in Bangkok and thousands of people visit each day. There are several ‘courts’ within the Palace walls. The Outer court contains the historic Temple of the Emerald Buddha (Wat Phra Kaew) which is stunning and it’s towers dominate this part of Bangkok. The Inner court is still private for the use of the Royal family and the Middle Court is the largest and most significant bit of the Palace that you will be able to visit. There are many attractive buildings here including the Phra Maha Monthian group with their traditional green roof lines. This was once the residential part of the palace for the Kings of Siam. 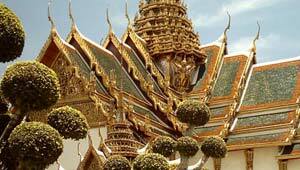 You will be expected to dress appropriately for a visit to the Temple of the Emerald Buddha. No bare shoulders or feet, no shorts and no see-through clothing. There is a booth at the temple which can rent you additional clothing if you need it. We found the dress code elsewhere inside the palace was more relaxed, but you are still visiting one of Thailand’s most sacred sites and you should bear in mind that you may be prevented from entering if you are not appropriately dressed. One other thing to watch out for – on our approach to the temple we were stopped by several people, some wearing official looking uniforms and badges, who told us that the palace was closed. Although parts of the complex do close for various functions, do not take the word of anyone until you get to the pay desks where it will be clear if any part of the temple is closed or not. We politely said thank you to the people who stopped us and continued to walk to the palace. We learned later than most of them are trying to get you to hire them as ‘guides’. One way to avoid this is to take the Grand Palace Guided Tour which consistently gets great reviews from people who’ve been on it. The Grand Palace is open daily from 8.30am to 3.30pm. Admission is 200 Baht.